Niamh Kavanagh was born in 1968 in Dublin. Her first big break came when she performed as a lead and backing vocalist on the soundtrack of 'The commitments', the 1991 movie starring Robert Arkins. 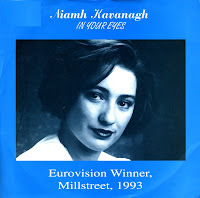 Two years later, she represented Ireland during the Eurovision Song Contest with 'In your eyes', a horrifyingly ugly ballad which for some strange reason won the hearts of the European juries, causing Ireland to win for the second time in a row that year. As if none of the other 24 songs were better. The single managed to reach number 24 in the UK singles chart, while, more appropriately, it didn't chart in the Netherlands.